The origin and evolution of fantastic beings and animals, the vyala, have not been deeply studied by scholars so far. The meaning and purpose of these fantastic figures has been lost in a far distant past. Scholars have still different interpretations for the composite animals seen on the Indus Valley seals and the sculptures and statuettes of the early period in India. Yet it is proved in this work, that there is a resemblance between composite animals of the Indus Valley and those discovered in archaeological excavations in the Gangetic Valley, some one thousand years later…. The reasons for illustrating supernatural animals seen on early Buddhist monuments - like Bharhut, Sanchi or Amaravati – has not been as yet fully understood. It was therefore necessary to record systematically the composite animals from earliest times and classify them according to their types: terrestrial, aquatic or celestial. With this classification, one can observe that these fantastic beings represent the three worlds. The rich amount of fantastic figures in Indian Museum has not attracted sufficient attention of visitors and scholars. On the other hand, some sites are very difficult to access. In the course of twenty years, Dr. Zhu has taken thousands of photographs. She visited more than a hundred sites, temples and monuments in different parts of India and she undertook a careful and methodical study of some twenty temples from the seventh to the thirteenth century (subject of the next publication). 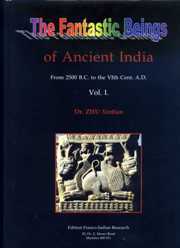 In this book, she presents her study from the Indus Valley civilization until the Gupta period, from 2500 B.C. to the sixth cent. A.D., particularly for the Buddhist period. She illustrates it with 352 drawings. Among the 415 photographs, most were taken by herself. This study demonstrates the continuity of the concept of composite and fantastic animals. They are part of life and art of this subcontinent. There were of course external influences, Greek and Persian…. For example, on the theme of the vyala-yaksa. The author analyzed their shape of indigenous origin and their transformation under foreign influence in the various sites of ancient India. The author explains the resemblance between the theme of the Tao Tie and the Kirttimukha, and between the Chinese Fuxi-Nüwa and the Indian Naga-Nagini, etc…. Since natural, composite and fantastic animals are present on most of the religious sculptures of India, this comprehensive work of Dr. Xintian Zhu will remain a landmark in the art history of India.